Marine source describes fighting as "our most significant encounter"
KABUL, Afghanistan (CNN) -- U.S. Marines on Friday kept up a major push against entrenched militants in southern Afghanistan in an attempt to rout the Taliban from their stronghold in Helmand province, Marine Capt. William Pelletier said. 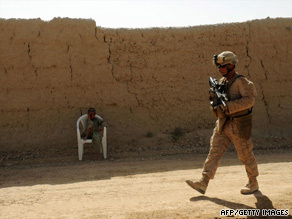 A U.S. Marine patrols Garmser district in Afghanistan's Helmand province on Friday. A Marine source described Thursday evening's fighting in the Helmand River Valley as "our most significant encounter." Sporadic fighting that began earlier Thursday stretched over several hours in the southeastern sector of Garmser district, said Pelletier, spokesman for the Marine Expeditionary Brigade-Afghanistan. Helmand province, a poppy-growing region, is the focus of the U.S.-led Operation Khanjar. Afghanistan supplies 90 percent of the world's opium, which is used in the production of heroin. The forces are attempting to gain and hold ground in the perilous region ahead of Afghan national elections in August. Almost 4,000 Marines and sailors from the expeditionary brigade, along with more than 600 Afghan national security forces, are operating in key population centers along the valley, Pelletier said. Their targets are Garmser and Nawa districts in central Helmand, and stretch to Rig district in the south, Pelletier said. Marines and Afghan forces have taken over the key town of Khan Neshin, the capital of Rig district, which had been under Taliban control, the Marine source said. The goal is to protect residents from the threat of Taliban and other insurgent intimidation and violence, Pelletier said. "Our focus is now and will remain the Afghan people. We have worked closely with local Helmand government officials and many tribal and local leaders in the detailed planning of this major offensive," said Brig. Gen. Larry Nicholson, commander of Task Force Leatherneck. Once security is established, civil affairs personnel and other nongovernmental groups and agencies can come in and establish programs. However, Taliban control of the countryside is so extensive in provinces such as Helmand and Kandahar to the east that security forces face a tough job, according to a report this week in The New York Times. The government has no involvement in five of Helmand's 13 districts, the report said. In the fighting that began Thursday, Marines fired 20 mm cannons from their Cobra helicopter gunships -- but dropped no bombs -- to avoid the higher risk of civilian casualties, the Marine source said. The source called resistance "heavy" and "persistent" but intermittent. Militants responded using small arms, rocket-propelled grenades and machine guns. "Last night, Marines bedded down in compounds within cities ... with permission from the people" rather than sleep in a restricted area away from the local population, Pelletier said. He said military leaders also were holding talks with village leaders. A Marine was killed and several others were wounded Thursday in the U.S.-led offensive, the Marines said. Some of the Marines suffered heat-related illnesses, they said. A Canadian soldier was killed and five were wounded when an improvised explosive device exploded near their armored vehicle. They were on patrol in the Zhari District in Kandahar province, next to Helmand. The incident occurred southwest of Kandahar City, according to the Web site of the National Defense and Canadian Forces. An Afghan man wounded by a Marine after disregarding warnings to stop while walking toward other Marines was in stable condition, the military said. The Marine fired a single shot Thursday when the man rapidly continued to approach the Marines. Russia will allow the United States to ship weapons across its airspace to Afghanistan, Kremlin spokesman Alex Pavlov said Friday. Pavlov said he doesn't know when the policy would take effect but said the details likely will come out when President Obama meets his Russian counterpart, Dmitry Medvedev, next week in Moscow. CNN's Atia Abawi, Barbara Starr and Jill Dougherty contributed to this report.